Rob has disabled Fly-Bys on his runs. Yet another move that says, "I'm hiding something, and doing a very bad job at it." Moron. All we would have to do is create a dummy profile with the data to replicate that. 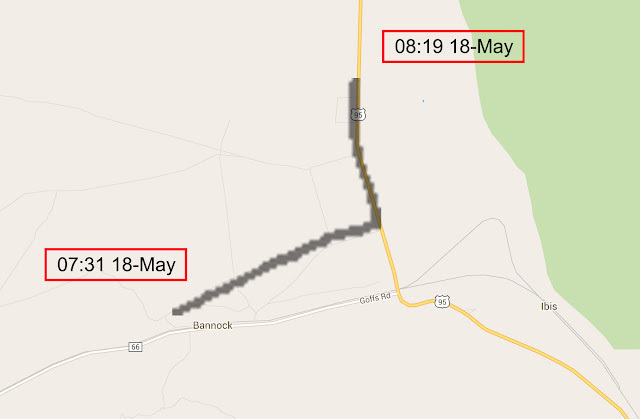 It means that the gps tracked a 2-mile stretch somewhere in the activity in 8:57 -- not altitude adjusted. Fastest 2 mile stretch is only 11:47 which is why I thought the "best estimated 2 mile effort" at 8:57 might be a conversion to flat course at sea level. To have a 2-mile stretch, you'd have to have at least one whole mile included listed in the splits. Fastest mile is 5:50. If that's part of the "best estimated 2 mile effort" of 8:57, then the other mile must be 3:07 (split up before and after the 5:50 mile since there is no whole mile split at 3:07 or anything close to it). That's why I thought maybe 8:57 was a conversion, not an actual 2-mile segment of this run. Like I said, I'm not a strava user so I'm trying to understand how this is calculated and what it means. Seems like I have one or two that are no longer on his profile because the mileage differs. Not sure which one it is. i think if you are a strava user logged in, it shows more stuff like pace (or if you download it and load onto your own). And they've been talking about his pace spiking into the 2 - 3 minute per mile range on occasion... showing that it's really hard to fake run speed in a vehicle for 3,000 miles without screwing it up at least once. 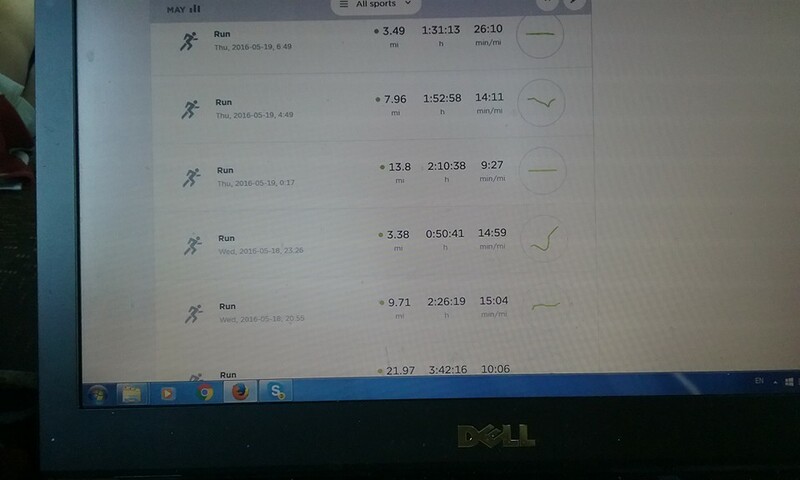 Here are screenshots of a 24.1 mega run on May 20 that has since been removed from strava. I would've created an account in strava to view more info if I had known. Oh well. Hopefully someone else captured it, and at least I got screenshots. I have more screenshots than I've posted that I can post later. I wonder if Dustin and Michael had the gps watch on the dashboard and watched its pace instead of the speedometer, to keep them from going too fast like sub-5 miles. Who knows. I am extremely offended by Mr Fuller's "troll" excuses. As a matter of fact I did comment on his self a aggrandizing blog with full name and main email. Because I care about that. A sideshow of this should investigate Mr Fuller's antics. Before that was deleted, I was looking closely and saw a sub-2:00 pace for about 3/4 of a mile, followed by a backtrack and some waiting. It means that the meaning of the word 'integrity' for Robbie has been destroyed by removing lettersâ€¦and Robbie is just left with â€¦none of the word 'integrity'. The word now has no meaning in reference to Robbie. Anybody familiar with code-for-hire listing on the web? We could advertise for the skills needed for an independent expert so Skins and Mr Fuller cannot easily weasel out with a "nephew IT expert". Now I know what bar he stopped at, although it looks like that part of the story probably checks out. Sorry if someone already pointed this out, but think I found a great tell in the maps. For some of the segments that start insanely fast and then end slowly, you will see a "buttonhook" pattern showing the TomTom backtracked slightly on it self. Sure appears like TomTom is in a vehicle, vehicle veers to the right and stops, watch and person get out on right side and walk towards back of the vehicle, person starts running and resumes previous track vehicle was on. Have found a couple of instances. Because of how the segments have been split it isn't always obvious when the switch occurred. Also number of instances where looks like pull over and continue on without the walk back. Either way, very straight GPS with fast miles, interruption in path, then slow miles that aren't nearly as straight as before. Does this seem plausible based on what Laz reported about how Rob ran?? Why get out and bother running the end of this May 17 segment only to pick up and "hammer" the next segment at blistering speeds? So he drops 2 min/mile is a mile, and he cropped the Strava run. Good job finding that slipup. This is 100% proof he cheated. It shows the TomTom data had 1 extra mile in it that did not appear in the Strava upload. This extra mile was covered in 2 minutes. bump. this part of the thread is too important to bury. Any LRC folks have a TomTom? What happens when you "Sync to Strava" from the site? Will Strava identify the device as TomTom? When you download GPX then upload it? What does Strava show for device then? Curious to what extent he manipulated these? Clearly there is no HR/cadence which is to be expected, right? Are those purposely stripped do you think, or did he figure out that GPX files would simply not contain that info, instead of TCX or linking to TomTom? Have a TomTom account, signed up for Strava a couple weeks ago (just for this thread). Current workouts will upload immediately to Strava, if you want to upload previous workouts, you have to download the GPX file and upload it to Strava. Current workouts say TomTom, older workouts say GPX. I uploaded 8 months worth of workouts in about 10 minutes, it's not hard if you're not trying to manipulate the data. thanks for checking that out and clarifying the name of the device on the strava links. Do you know about cadence? any idea about his watch type and whether there was cadence or HR data associated with it?